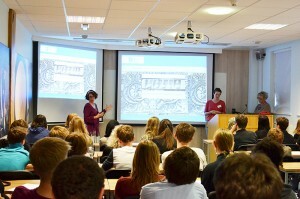 Why I was interested in the classics study day. Hi, I’m Joe Wood; I’ve recently finished my undergraduate degree in Archaeology and History. I volunteered to lead a seminar on Roman history because I had greatly enjoyed studying my topic of teaching, the Ostrogothic kings of Italy. I lead a seminar titled “The city of Rome and the Gothic War” which focused upon the importance of Rome in a world where the Byzantine Empire had become a superpower and pushed the eternal city to a peripheral kingdom as power shifted east. I was interested in teaching this because it allowed me to expand my knowledge on the Ostrogothic kings and the gothic war, as I had written my dissertation on the first Ostrogothic king of Italy, Theodoric the Great. Ultimately I was very interested to share my knowledge on the Gothic War and greatly enjoyed doing so. This entry was posted in Blog and tagged Joe Wood, Study Day on July 14, 2013 by Joe Wood.